Good cartwheels take a lot of practice! Knowing how to do a cartwheel is a vital skill for cheerleading. Cartwheels are one of the basic skills you'll need in order to later learn more important tumbling stunts such as round-offs. Doing a cartwheel requires minor upper body strength, but doing multiple cartwheels regularly and properly will help you build additional upper body strength. Upper body strength comes in handy when doing handsprings, walk-overs and more. There are some basic steps that will lead to the perfect cartwheel. First, can you hold a handstand against the wall? If so, you likely have enough upper body strength to do a cartwheel. Always start on a soft surface, such as a padded mat, in case your arms cannot support you and you collapse. This will help you avoid getting hurt. Lift your arms straight over your head and face the direction in which you'll begin the stunt. Make sure you have enough room to complete the cartwheel without bumping into anything. Point one foot straight forward, but keep it on the ground. Reach toward the ground with the same hand as the foot you are pointing with. So, if your right foot is pointed forward, place your right hand on the ground. Your left hand should follow closely behind. When the first hand touches the ground, the opposite foot should begin to lift off the floor. When both hands are on the ground, give a strong kick/push with your legs. Both of your legs should come off the ground, and you'll support your body with your arms. You'll land on the opposite foot from the one you started. As you pull yourself into a standing position, be sure to bring your arms straight up into the air and hold them up straight by your ears. The goal as you combine all of these elements is to do so with a smooth, fluid motion. One movement should flow into the next, so that the cartwheel is a never-ending spiral of motion. Try to think about your movements as hand down, foot up, hand down, foot up. This is the order in which you'll place each appendage, it just happens very quickly! 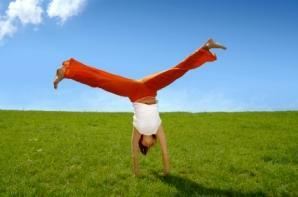 There are several things you can do that will make your cartwheels better. Lock your arms. If your elbows bend, you'll likely fall. When you land, bring your arms up and give a little jump. This will prepare you for when you do a round-off into a back handspring. Do push-ups. Upper body strength is vital. The stronger your arms and shoulders, the better your cartwheels. Do handstands against the wall and hold for as long as possible. Again, this builds upper body strength. Point your toes. This keeps your body in a straight line and also creates a long, elegant look. Practice makes perfect. Keep practicing until you get it right. Have a tumbling friend show you how. Teach yourself in your own backyard (always use caution, mats and make sure you have supervision). Take tumbling or gymnastics classes from a professional. Facilities often have tools such as trampolines to help you learn more quickly. Cheerleading coaches. Most coaches know at least some tumbling, and they can help you. Videos: Sites such as Amazon.com sell tumbling videos that will show you how to do a cartwheel and other stunts. Books: Check your local library for books on cheerleading tumbling. YouTube. This websitesite is filled with videos on just about anything you can imagine, including instructions on how to do a cartwheel. Explore this site! LTK Cheerleading is a vital resource for information on all things to do with cheerleading. Check back often for fresh articles.